Or, get it for 56000 Kobo Super Points! Patients with tracheotomies are managed by a wide variety of healthcare professionals. As a result, information regarding best practice is scattered throughout the medical literature and can be difficult to identify and implement in the clinical setting. Tracheotomy Management: A Multidisciplinary Approach is a practical review of all tracheotomy procedures and acute and chronic tracheotomy care. It combines evidence-based practice and expert opinion to create an invaluable hands-on guide for any healthcare provider managing patients with tracheotomies. Each chapter is authored by at least two different subspecialists, contains case studies with real-life examples of problematic clinical scenarios, and is enhanced by high quality images. The rationale for different approaches is discussed to guide the decision-making process. 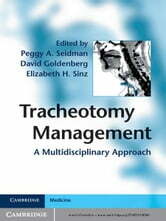 Written and edited by tracheotomy experts from a wide variety of disciplines, Tracheotomy Management: A Multidisciplinary Approach is essential reading for anesthesiologists, nurse anesthetists and critical care and emergency physicians.